One of our previous essay competition writers, Guy Stanley, has been having a very busy time in Ghana! Guy is currently at the National Reconstructive Plastic Surgery and Burns Centre at Korle-Bu Teaching Hospital, Accra, Ghana (pictured). Despite arriving without a solid plan Guy is currently working on 3 fantastic projects including collecting data on around 80 victims from a tragic fire at a petrol filling station which Guy is hoping to present at the upcoming BAPRAS – British Association of Plastic Reconstructive and Aesthetic Surgeons – meeting and to later publish his findings. 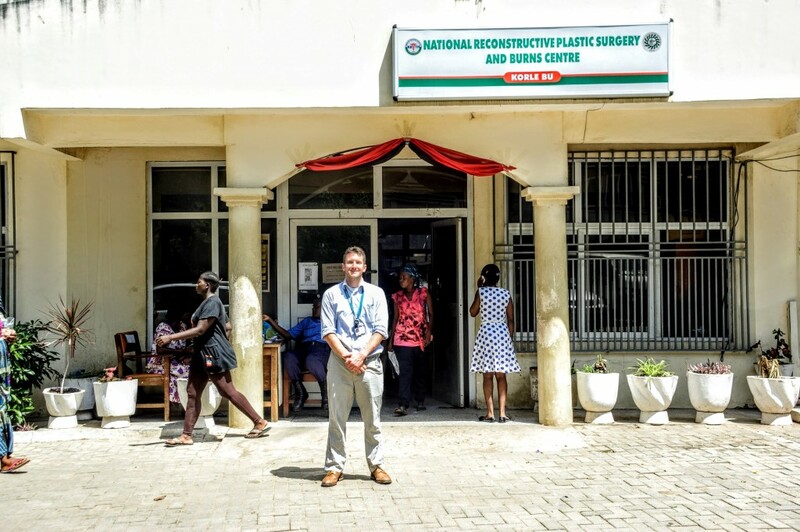 The most major of Guy’s ongoing projects is under the guidance of Restore’s Jonathon Pleat, looking at the public understanding of keloid scars through the comparison of two populations; Ghana and the UK. A study of the this kind has never been undertaken after collecting their data they are hoping to write up and publish their findings! Following all of this extremely exciting work Guy is going to have some well deserved time with his family and a sky-diving holiday before beginning work at Salisbury Hospital in August, which is of particular interest to Guy due to the having a regional burns unit and will allow him to do a plastic surgery rotation. During his time at Salisbury Guy is intending to be involved in a project investigating the use of pulse-dye lasers to remove scars. Following at least a year at Salisbury Guy is intending to head out to South Africa or a resource poor country to rapidly acquire more surgical experience. We wish Guy all the best of luck with his endeavours and look forward to hearing more from him soon!